Check out #Peaks&PingPong in ActionSection! "Only dudes in a hut for a week!? Who cooks for you?" But we get along nicely and develop to funniest games in the snow. That's why last seasons edit is called #Peaks&PingPong. Check out #PowderNinjas 2.0 in ActionSection! #PowderNinjas 2.0 is a homemade film about a roadtrip through Hokkaido from 17th of February to 3rd of March 2018. Check out #PowderNinjas 2.0 - Teaser in ActionSection! Full edit dropping 3rd of March 2019 in the ActionSection. SnowFront loves Scarpa because their boots bring us to the highest mountains. Check out #SICKSKIS in ActionSection! Check out #FJORDSandPEAKS in ActionSection! On the ski trip, Fjords&Peaks‚ four Tyroleans by choice (two freeski mountaineers and two split boarders) travel to the Lyngen Alps - Norway from 21st of April to 5th of May 2016. There they get to know the iconic mountain range around Tromsø, in search of a never ending winter and wild descents. Check out SKY&SNOW in ActionSection! SKY&SNOW is MGM's first season with a drone. Snow was not that good in the Alps at the beginning of the season 2016/17, but this is what he could find. Check out 50 Foot Razerblade in ActionSection! Massakka's smooth and short clip from the season 2016/17. Check out back in the days | spring 2010 in ActionSection! Check out Spirit of Tirol - Chapter #5 - long hike, no powder in ActionSection! Spirit of Tirol is MGM’s season 2015/16. The five minute film drops in five weekly webisodes from the end of December 2016 to the end of April 2017. Check out there is some snow | DJI Mavic Pro on Gjaid Alm in ActionSection! Krippenstein at Dachstein is known for its crazy amount of snow. At least there is some this season. Check out #PowderNinjas in ActionSection! Check out Spirit of Tirol - Chapter #4 - short flight, nice ride in ActionSection! Check out Spirit of Tirol - Chapter #3 - peace of mind in ActionSection! Check out Spirit of Tirol - Chapter #2 - snow is my religion in ActionSection! Check out Spirit of Tirol - Chapter #1 - mountains are my church in ActionSection! Check out Massakka - he shreds it all in ActionSection! This is SnowFront's Massakka's season 2015/16 at his local snowpark highfivesnowpark/Steinplatte and some bluebird deep powderlines at Mayrhofen. SnowFront loves Hymer because RVs get us into the snow with dry feet. Check out SlushParty in ActionSection! Check out Magu fun in ActionSection! That will happen if you drink Magu and shred some deeppow. You will forget who you will be, what you will be wearing and the planks you will be on. You will realize that the only essence of fun is smile and powder faceshots. Check out #BallsDeep in ActionSection! #VimeoWednesday | #BallsDeep was shot on two days in #MyEarHowFan. (2016-03-09 & 2016-03-04). SnowFront’s TeamRiders BRob & Massakka enjoyed big mountain lines faceshots & fun runs in ballsdeep powder. SnowFront loves Strafe because their outerwear is inspired by a dedication to living life in the mountains. Check out steil ist geil in ActionSection! steil ist geil setzt sich aus einigen Rinnen, Kämmen und Gipfeln in Tirol zusammen. MGM bestieg und befuhr sie in den letzten beiden Saisonen. Check out #PowderBros in ActionSection! SnowFront’s TeamRider BRob & Massakka are shredding their home resort and having fun riding deep powder and bouncing over pillows. Check out trees & knees in ActionSection! trees & knees is MGM's season 2013/14 in the trees. He enjoys his #rubberknees bouncing over pillows and taking tight turns in the trees. Check out SoulLine in ActionSection! SoulLine is one line of Max 'MJ' Kaffl at SnowPark Steinplatte. Check out what the fog in ActionSection! Most people say the first sunny day after a snowfall is the best powder day. Obviously you can ski the foggy and snowy day anyways. But it won't be any fun, any fun at all. #WhatTheFog is the foggy part of MGM's season 2014/15 in the trees of "Tiroler Unterland". Check out #PowderTuner in ActionSection! The LoveTuner allows us to focus on our runs before we drop in. The LoveTuner is a one tone flute that calms your breath down and makes meditation easier. We tried it for #PowderTuner in March 2013 before we shred some pow on the Loaded Snow #Algernon. Check out high altiDude in ActionSection! #highAltiDUDE is what happened in 2013/14 in Tyrol and Switzerland before MGM left Europe for his #AdventureSeeker journey across the US. Enjoy repelling, couloirs, powder, pillows, cliffs, glaciers and slowmotion whiterooms above treeline. Check out classic MJ in ActionSection! Max 'MJ' Kaffl does what he does best: Crazy flips, spins & slides. Enjoy his edit consisting of his instaedits 2014/15 and follow him on Instagram. Check out just DUDE it in ActionSection! Tune your skis, climb steep couloirs, spin of big cliffs, shred deep tree lines and have fun in the sun. #justDUDEit is the sunny part of MGM's season 2014/15 in the trees of "Tiroler Unterland". SnowFront loves Sionyx because their merino socks and underwear keep us dry and warm. Check out Absolut Massakka in ActionSection! Sorry for your knee Sworsch, but thanks for filming. We had a nice'n sunny day at Absolutpark Flachauwinkel and did some laps on Saturday, 14th of December 2015. Check out #PRAYFORSNOW in ActionSection! We hope this prayer in form of an edit of MGM's pre-season in Tyrol and Switzerland in December 2013 will help us this winter and let big snowflakes fall on the Alps. Join us praying for snow by sharing the edit and using #prayforsnow. Let's send some positive energy to the clouds! Skiing and riding in between avalanche barriers is extremely dangerous. Imagine tons of snow crushing you on solid steel. Don't try this! MGM has been skiing for over 25 years and knows what he is doing. His solution is speed. Check out Massakkamera in ActionSection! #Massakkamera is one line of SnowFront TeamRider Mario 'Massakka' Kötterl in #StubaiZoo filmed with several cameras. Check out Splitgernon in ActionSection! #Splitgernon shows Georg 'GWack' Wagner splitting a prototype of the Loaded Algernon. The board is entirely made out of bamboo. Bamboo is perfectly water resistant. That's why he didn't even have to seal the cut. The regular Algernon is great to ride and easy to split. Check out POLES ARE FOR STRIPPERS in ActionSection! 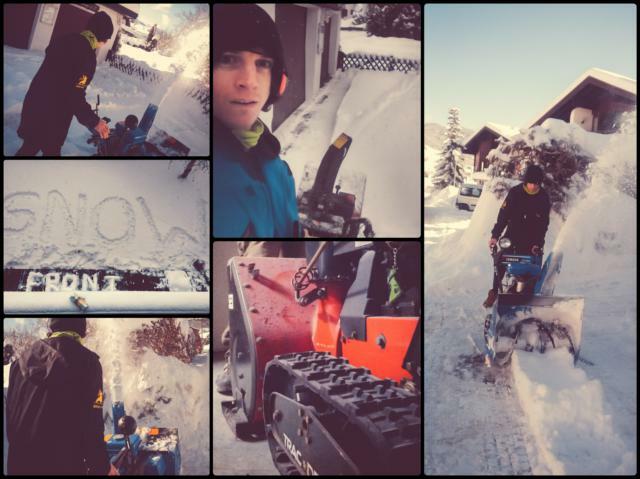 This is SnowFront's TeamRider Jannis 'Hoffi' Hoffmann's edit of his season 2014/15. Check out FUNLAPS & BIG CLIFF in ActionSection! This is SnowFront's Mario 'Massakka' Kötterl's Season 2014/15 on Steinplatte. Check out AdventureSeeker WEBISODE #5 in ActionSection! #AdventureSeeker is a 90day, 7000mile FreeSki mountaineering trip across the US. SnowFront.org 's MGM visited twenty ski areas between Denver and Seattle from 12th of February to 12th of May 2014. #AdventureSeeker is a one man project. MGM did the riding, filming & editing himself. It is about storytelling. So don't give him sh** about using his crappy phone's camera if necessary. The thirty minute documentary is entirely edited. To make it easier to watch, it is split down to five WEBISODES dropping weekly in fall 2015. Check out AdventureSeeker WEBISODE #4 in ActionSection! AdventureSeeker - right here, right now! Check out AdventureSeeker WEBISODE #3 in ActionSection! Check out AdventureSeeker WEBISODE #2 in ActionSection! Check out AdventureSeeker WEBISODE #1 in ActionSection! Check out SoulSurfer in ActionSection! SnowFront loves Pomoca because their high quality skins fit any ski or splitboard, perform in the backcountry and glide very well. The #AdventureSeeker had to realize more commercial projects for MaxMeissner.de. The #AdventureSeeker had to move and work on the new house. The #AdventureSeeker had to keep the yard free of snow at the new house. New SnowFront-HomeBase in snowy Reit im Winkl. Official #AdventureSeeker release in Fall 2015. Stay tuned for posts from this season and keep on watching the #AdventureSeeker teasers. P.S. It’s dumping here in Reit im Winkl. New SnowFront-Team: More compact and powerful than ever! SnowFront loves Haexa because they make stylish clothing for the streets and awesome softshells for the mountains. SnowFront loves Magu because their natural energy drinks give us motivation, strength and staying power on the mountains. Check out heavy DUDEty in ActionSection! Check out nice attiDUDE in ActionSection! nice attiDUDE is Mario "Massakka" Kötterl's film SnowBoarding in the Alps. The winter was very dry and warm in the north, that's why Massakka traveled to the south to find some pow and killed the park at his homeresort in spring conditions for the rest of the season. Check out I am the AdventureSeeker in ActionSection! #AdventureSeeker is a 90day, 7000mile FreeSki mountaineering journey across the US. SnowFront's "MGM" visited twenty ski areas between Denver and Seattle from 12th of February to 12th of May 2014. This is the first teaser for the fifteen minute documentary still dropping this fall. MGM says thanks to all his supporters, family, friends and sponsors for making the journey possible. Check out AdventureSeeker and the Van in ActionSection! This is the first teaser for the fifteen minute documentary still dropping this fall. One more teaser is going to follow next week. Check out AdventureSeeker Trailer in ActionSection! This is the first trailer for the fifteen minute documentary still dropping this fall. Two more teasers are going to follow in the next two weeks. SnowFront loves HoneyStinger because their organic protein and energy bars give us motivation, strength and staying power on the mountains. He reached and skied Big Sky. SnowFront TeamRider Max "MGM" Meissner had an awesome journey in Utah. He met Icelantic ambassador Christian James Overson. They skied Alta's sidecountry together and hitchhiked back to the van from Brighton. The next day they took CJ's family, the truck and a trailer into Mill Creek, WY so they could sledski in the Uinta Mountains. Being back in Salt Lake City, MGM had a daytrip skinning Canyons' sidecountry with Morgan VerMerris. SnowFront TeamRider Max "MGM" Meissner put a queensize bed, a Dynafit/Amplifi BootDryer and an Icelantic shelf in his white van. He changed it from white to black at ClubWorkShop in Denver and finally left the city. Shredding "MiniGolfLines" in WinterPark was awesome. He found great BackCountry in SteamBoat, too. His first resort in Utah was SnowBird. He enjoyed BirtdayChutes and a fun jump there. SnowFront TeamRider Max "MGM" Meissner checked out the resorts on Interstate 70. So he went to Telluride, Osprey Packs and three other resorts. 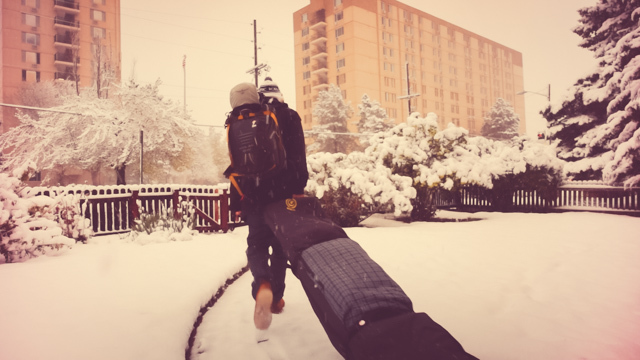 SnowFront TeamRider Max "MGM" Meissner checked out the resorts south of Denver first. So he went to Loveland, Aspen and Telluride -just great- and two other resorts. SnowFront loves Swix because their wax and accessories keep our skis and SnowBoards crazy fast and tuned. 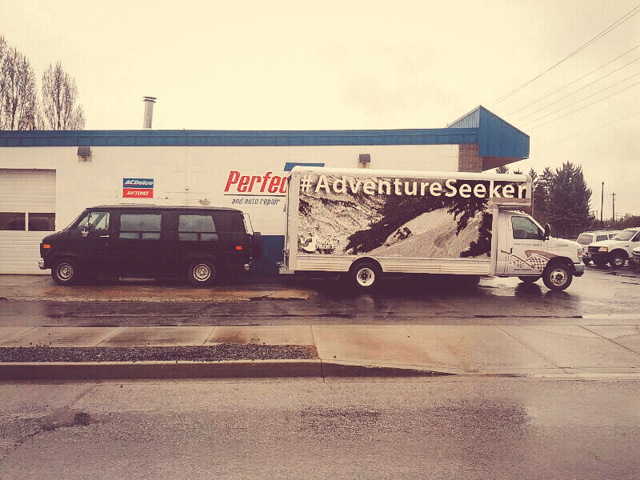 "#AdventureSeeker" is a FreeSki-Mountaineering road trip through North-America. SnowFront TeamRider Max "MGM" Meissner will travel on his own from Denver to Vancouver and stop in as many ski-resorts as possible. During that time there are going to be daily posts on Instagram, Tumblr, FaceBook & SnowFront.org as far as mobile reception allows it. SnowFront loves Leki because they produce high performance and heavy duty ski-poles. SnowFront loves ABS because an Avalanche Airbag is the only tool that can avoid an avalanche burial. Check out World of Wookiee! in ActionSection! SnowFront TeamRider Max "Hartwin" Stein spends his snowboard seasons staying in one single village in the Alps. The only two pairs of shoes he wears during that time are snowboard boots or slippers. Living in his recluse world, there is no need for shaving or hairstyling. That's why we call him wookiee! SnowFront loves Amplifi because their bags allow us to travel with style and comfort. Check out AlpenGypsy! in ActionSection! 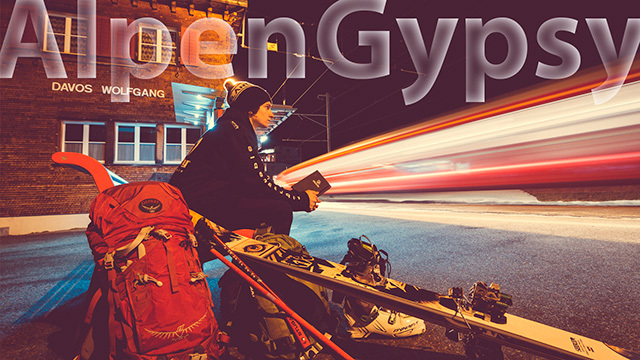 AlpenGypsy is the edit of MGM's freeride season 2012/13. The SnowFront freeskier visited all 85 ski resorts in Tyrol (Austria) and had an additional trip to Gran Paradiso (Italy) and Mont Blanc (France). the Osprey Kode backpack & Stubai Bergsport mountain gear. He wears the HappySnowFlow HSF hoodie and a Grounded Europe wristband. He pushes himself with Crowns Classic & Elderberry and finds his focus with the V-528 LoveTuner. Be sure to watch fullscreen and in HD on Vimeo! SnowFront loves Atewa because their active heating system (AHS) gloves keep our hands warm and their protection keeps us save. SnowFront loves Dynafit because they make merciless lightweight FreeRide boots and bindings with limitless performance. SnowFront loves Osprey because their packs help us with function and style to move towards and in the BackCountry. SnowFront loves Stubai Bergsport because their professional mountaineering gear allows us to expand our minds and our tours on rocks and ice. BRob, Hartwin, Massakka and MGM are back from an amazing journey through PortuGeil. We had awesome surfs and enjoyed our time skimboarding, long-boarding, partying, relaxing and BBQing at the beach. Check out the images on PhotoFolio, Tumblr & FaceBook. We say thanx to all our friends, cooperations and supporters. Stay tuned for a great summer with sweet posts. Check out Nice shrEDIT! in ActionSection! One day building the mini shred, one day shooting, one day editing, one world, one love, one awesome week on the chalet. SnowFront loves Loaded because their boards allow us to keep on traveling and to have fun on boards during summer, also. SnowFront loves NoReturn SnowBoards because their SnowBoards are very light and stable. They have innovative shapes and awesome TopSheets. All Boards are handmade in Germany with materials from Europe. SnowFront loves IceLantic because they supply the skis with the most awesome ArtWork by Travis Parr and amazing shapes, flow and durability. Their TwinTips help us expanding our minds weather we try new tricks in the park or progress our level in powder. ISPO AWARD GOLD WINNER 2013 Hansi shot with MGM & MJ in PetesTail still before ISPO. SnowFront loves v-528 because their LoveTuners help us calming down and tuning in on each other before a hike, ride, air, jib or trick. Tuning became SnowFront's ritual to get focused and involved with each other. SnowFront loves POW because their gloves are built to last. The gloves and mittens keep our hands warm. The PipeGloves are sticky like a gecko. SnowFront loves Bern because their helmets keep our heads protected, warm and filled with music. Additionally they have outstanding style with the patented cap like visor. SnowFront loves Grounded Europe because their wristbands keep us grounded. They help us to stay in balance on slides, FreeRideLines and to stomp our tricks perfectly into the landing. SnowFront loves HappySnowFlow because they make awesome TallHoodies and shirts that keep us warm with style. SnowFront loves Hansi Heckmair because he takes the most epic freeride shots of us. All the TeamMembers got a new profile with some information and a sweet photo. TeamRider Daniel "Tiger" Mösl wins Gloryfy BASTARDS! On 2013-01-18 TeamRider Daniel "Tiger" Mösl wins Gloryfy BASTARDS with a Tripple BackFlip. TheCat and Benny participated with awesome style! It was a sweet event with an amazing afterparty. Photos by © hansiheckmair.com in PhotoFolio! Craziest wallpaper so far now in DownLoads! Check out the new MonkeyWallPaper in DownLoads. Check out SnowFront's Veit is coming - call 144! in ActionSection! Sebastian "Veit" Hell is one of SnowFront's most talented FreeSkiers. He rides kickers and urban rails. He broke his jawbone twice during his slam @ the GapKicker in KidsPool (2012-03-29). Additionally 3 back teeth were crashed. Four months later he was fully recovered and back on skis. SnowFront is coming - call 911! SnowFront loves Gloryfy because their goggles keep our vision clear and withstand the hardest impacts. 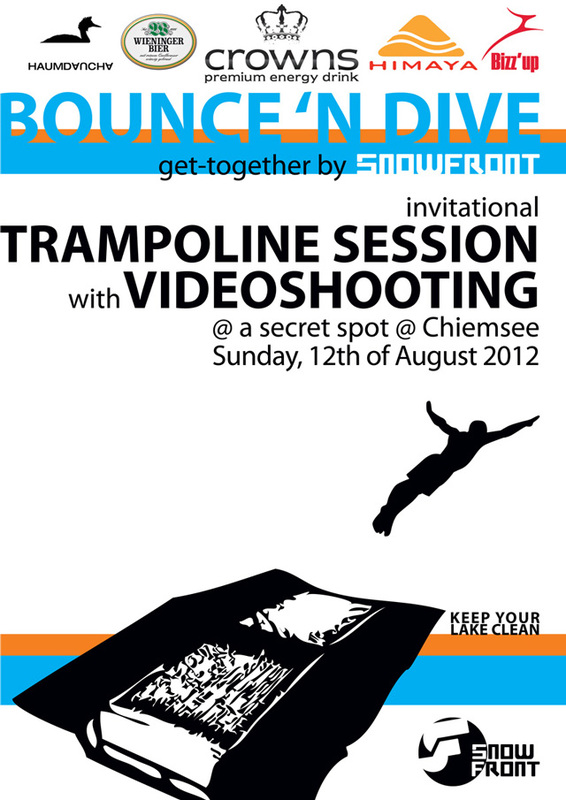 Check out BOUNCE'N DIVE: SnowFront's get-together in Summer 2012 in ActionSection! DownLoad the new SnowFront persona! The new and official FireFox persona in the colors Purple - Black - Orange is available for DownLoad ! Two new WallPapers from PortuGeil in DownLoads! Check out the new WallPapers in DownLoads! 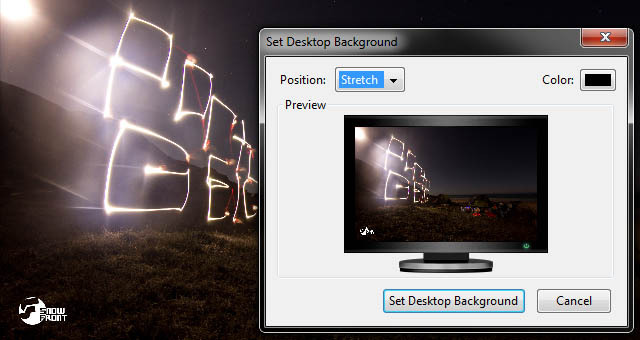 You can install them via RightClick -> "Set As Desktop Background..."
Be sure to choose "Stretch" and the wallpaper will fit any 16/9 screen up to 1920x1080! Season 2012/13 is gonna be all purple! For SnowFront's color change from cyan to purple, Damion Hawkins from DaimEntertain sang a tribute to Deep Purple's "smoke on the water". The season 2012/13 is gonna be awesome and all purple! SnowFront's get-together "BOUNCE'N DIVE" went smoothly on Sunday, August 12th 2012 on a jetty between Gstadt and Gollenshausen at Chiemsee. We had an awesome time, bounced on a trampoline and dived into the Chiemsee. Our thanks go to all our helpers, sponsors, members, buddies and visitors. We had as few visitors as we hoped (about 50), since we have our main visitors in the web. Special thanx go to Tom Wegert for the music, Hansn, BRob, Massakka, MJ, Gwack, Veit, Tiger, Melina, Jessi Dahlmann, Laura Schmidt, Flo Lex, Lucas Mayer, Johannes Baumann, Christoph Thalhauser, Daniel Kreisel, Daniel Dettelbacher, Daniel Schuhbeck, Nici Kötterl, Viktor Schelhas, Georg Kötterl, Family Brillert and die-filmer who supported us with a lot of effort. Our sponsors *** crowns *** premium energy drink, Wieninger Bier and Himaya Sports Sun Protection supported us with a reasonable amount of products. Thanx for that! The participants ( Robin "BRob" Brillert, Georg "GWack" Wagner, Johannes "Hansn" Zenz, Max "Hartwin" Stein, Hubert "Hubsi" Zenz, Mario "Massakka" Kötterl, Melina Merkhoffer, Max "MGM" Meissner, Max "MJ" Kaffl, Severin "Sev" Wegener, Daniel "Tiger" Mösl und Sebastian "Veit" Heel) could not be discouraged by the cold breeze and showed their skills with spins and flips on the trampoline. Melina, Tiger and Veit accepted the longest journey with their beachcar and staged it in a great way for the filmcamera. The footage produced will be edited and uploaded on Vimeo and ActionSection still in November. We are glad there were neither injuries, damages nor complains. We are looking forward to a fruitful cooperation with our partners. Check out TWEAK LIKE A FREAK by SnowFront.org 's Max "MJ" Kaffl in ActionSection! Check out HOW DEEP IS YOUR POW? by SnowFront.org 's MGM in ActionSection! Enjoy the new immersive MultiMedia pleasure with our SoundCloud player in PhotoFolio and support our local music artists. All artists cooperate with SnowFront.org and are responsible themselves for their copyrights and samples used. Stay tuned for the edit still dropping in February 2012! 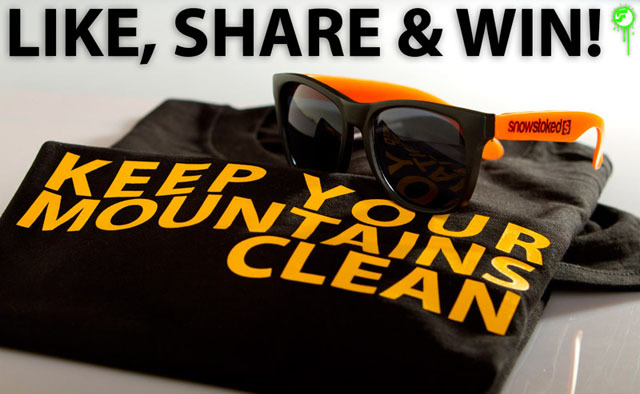 Like SnowFront - Keep your mountains clean on FaceBook and share this link to win one of 10 SnowFront - Keep your mountains clean shirts and SnowStoked x SIMON&ME sunglasses. Increase your chances by liking SnowStoked and SIMON&ME! Check out BackYard Shred by SnowFront's Daniel "Tiger" Mösl in ActionSection! U can find the rest of the Members in "Buddies"
Still keeping the mountains clean! Stay tuned for news dropping on FaceBook in 2012! Check out the new like button below and SnowFront - Keep your mountains clean in imprint. SnowFront is a SnowBoard- & FreeSki- Team freely created by buddies who shred togehter to push their level and each other. On february thirteenth 2005 Arnie, Pansen and MGM were stocked to start SnowFront. SnowFront-Members share their cars to get to the spot, no matter if it's an urban jib, backcountry kicker, powder ride or freestyle park, day and night. SnowFront uses this website to share its vision with the team-members and all the other shred-heads out there. To do so SnowFront's professional camera dudes and photographers spare no effort and creativity to blow your mind with their sweetest shots.